Falkenberg is on the south-west coast in the district of Halland, 110 kilometres south of Gothenburg. From the E6 turn onto the 150 in the direction of Falkenberg. Follow the 150 to the town and over a large road junction to a roundabout. At the roundabout turn right into Halmstedsvagen and the cemetery is along here on the left. 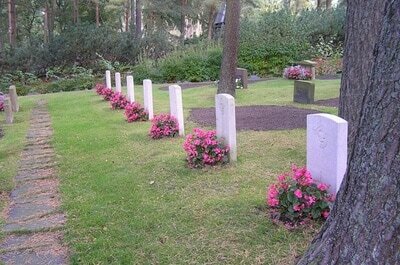 The Commonwealth war graves lie in a grass plot beside a flagged path, overshadowed by trees. Falkenberg Forest Cemetery contains the graves of seven Commonwealth airmen of the Second World War, one of whom is unidentified.